This alabaster was made to be a devotional piece, and other similar examples survive in various collections across Europe, but this piece is particularly fine, being a perfect example of a combination of older, traditional styles, with the the most up-to-date developments in art and the realism and naturalism of painters like Rogier van der Weyden and Jan van Eyck. 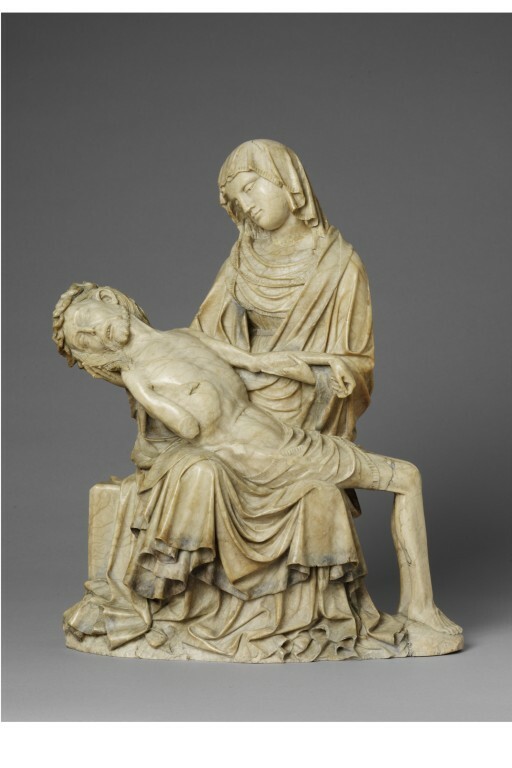 The sculpture emphasises Christ's physical suffering and the anguish of his mother. The object helped focus the mind of individuals on contemplation of man’s redemption by Christ’s sacrifice, and the Virgin’s acceptance of his death for the sake of mankind. 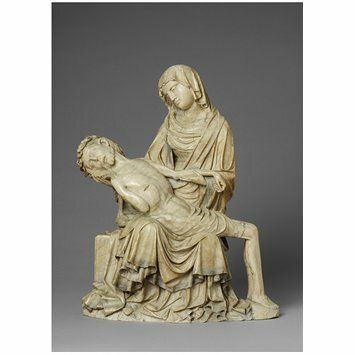 The southern Netherlands were an important centre for the production of alabaster sculpture during the 15th century, and while not producing the numbers that the English alabaster workshops turned out, they certainly exceeded their English counterparts in quality of craftsmanship. The English alabaster-carvers dominated the lower end of the market, catering for patrons right across Europe who could not afford to spend very much but were eager to furnish their parish churches and homes with religious imagery. The Netherlandish workshops, by contrast, produced fewer but many times more carefully finished alabaster sculptures, which were also considerably more expensive to buy. Statue in alabaster of The Virgin with the Dead Christ. The Virgin sits on a low bench supporting the Dead Christ on her lap; she holds His outstretched left arm with her left hand, and supports His head with her right hand. Her head is covered with a short veil and she wears a full mantle over a belted gown. The Dead Christ lies across her knees wearing the crown of thorns on His head and with the spear-wound visible on the right side of his chest. The present alabaster group is almost certainly by the artist known to us by the alias of the 'Rimini Master' (see P. Wiliamson and P. Evelyn, 'Northern Gothic Sculpture 1200-1450', V&A publication, London, 1988, pp.187-191), a sculptor who has been shown to be probably a South Netherlandish alabasterer. He - or perhaps they, being presumably an export workshop - was also responsible for the famous alabaster Crucifixion scene from the church of St. Maria delle Grazie in Rimini-Covignano, now in the Liebieghaus, Frankfurt. The Rimini Master's work was exported to North-east Italy, amongst other places. 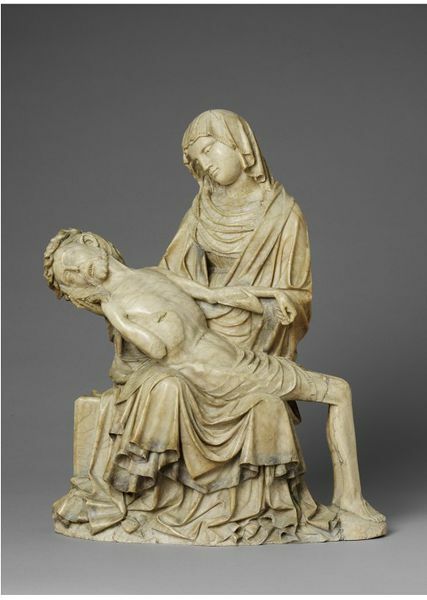 This alabaster was made to be a devotional piece, and other similar examples survive in various collections across Europe, but this piece is particularly fine, being a perfect example of the Rimini workshop's combination of older, traditional styles, with the the most up-to-date developments in art and the realism and naturalism of painters like Rogier van der Weyden and Jan van Eyck. Interestingly, we know that alabaster, a fine-grained form of gypsum (hydrous calcium sulphate), from England was exported raw in blocks to the Continent for use by sculptors. Unfortunately, it is not yet been possible to identify the national origin of alabaster from its appearance or geology; alabaster was also mined in the Netherlands itself, and this is more likely to be, therefore, native stone. Artists and Craftsmen of the Middle Ages: exhibition from private collections of incunabula, sculpture, paintings and drawings of the fifteenth and sixteenth centuries, Manchester: Whitworth Art Gallery, 1947.